A collection of classic, fantastical tales from Northern Japan that are equal parts whimsical and sophisticated, perfect for readers of all ages. 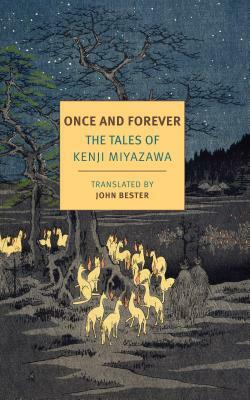 Kenji Miyazawa is one of modern Japan’s most beloved writers, a great poet and a strange and marvelous spinner of tales, whose sly, humorous, enchanting, and enigmatic stories bear a certain resemblance to those of his contemporary Robert Walser. John Bester’s selection and expert translation of Miyazawa’s short fiction reflects its full range from the joyful, innocent “Wildcat and the Acorns,” to the cautionary tale “The Restaurant of Many Orders,” to “The Earthgod and the Fox,” which starts out whimsically before taking a tragic turn. Miyazawa also had a deep connection to Japanese folklore and an intense love of the natural world. In “The Wild Pear,” what seem to be two slight nature sketches succeed in encapsulating some of the cruelty and compensations of life itself. Kenji Miyazawa (1896–1933) was born in Iwate, one of the northernmost prefectures in Japan. In high school, he studied Zen Buddhism and developed a lifelong devotion to the Lotus Sutra, a major influence on his writing. After graduating from an agricultural college, he moved to Tokyo to begin his writing career but had to return home to care for a sick sister. He remained in his home in Iwate for the rest of his life. One of his best-known works is the novel Night on the Galactic Railroad, which was adapted into anime in the late twentieth century, as were many of his short stories. Much of his poetry is still popular in Japan today. John Bester (1927–2010) was a renowned translator of Japanese fiction, including Masuji Ibuse’s Black Rain, Kenzaburo Oe’s The Silent Cry, and Yukio Mishima’s Acts of Worship: Seven Stories, for which he received the Noma Award for the Translation of Japanese Literature. "These tales turn familiar fairy-tale rhythms on their hands, balancing chaos and kindness, the natural and the supernatural, the unsettling and the inspiring. It will be right at home in any library of short stories or modern folklore.” —Genevieve Valentine, NPR, "Best Books of 2018"